8 oz / 236 ml $17.66. 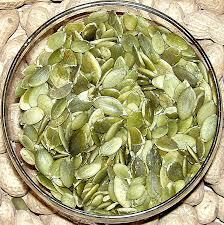 PUMPKIN SEED OIL – Extracted from raw pumpkin seeds. Deeply penetrating to rehydrate skin. Anti-inflammatory – calms burns / rashes / eczema / psoriasis / rosacea. Rich in antioxidants Vitamin C an E, which fight wrinkles. Essential fatty acids promote natural oil regeneration. Pour this Pumpkin oil over your food, for a powerful nutrient boost.